I went to a wedding two weekends ago in Fredericksburg, Virginia. It was an excellent wedding and I thought I would share some of the items that made it particularly neat. My little sister got to do something I’ve never done! She was a bridesmaid! And she was a beautiful one at that! Before the ceremony began, I noticed I could see my sister standing outside through window– so I got a sneak peak at her dress! Thinking about my beautiful sister still makes me smile. This wedding including something called a “Sand Ceremony”. Both sets of parents poured blue sand into a jar and then at the end, the bride and groom poured sand in as well. During the reception, the resulting artwork, a piece created by the love of two families, was on display at the head table. I had not seen a sand ceremony before and it was a nice touch. 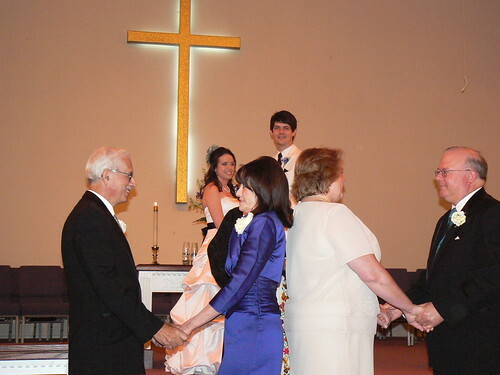 After the bride and groom took their vows, both of their parents renewed their vows. Another thing I hadn’t seen before! Caramel deLites… bah! I call my favorite flavor of Girl Scout Cookies by their original name– Samoas. 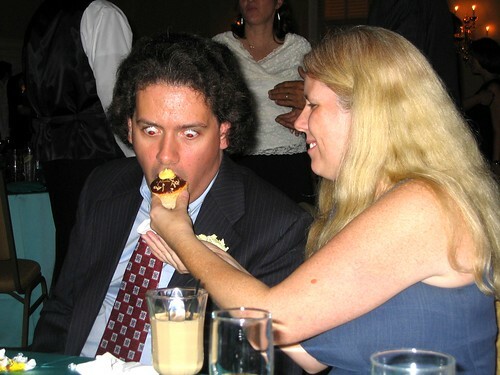 To compliment the wedding cake, this couple had an array of unique cupcakes, including one inspired by Samoas. Too cool! 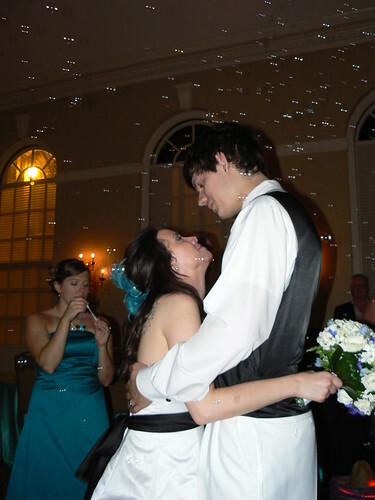 During the couple’s last dance, the guests armed with their the departure bubbles surrounded the couple and blew. It made for a magical end to a wonderful wedding. Neat Things About the Reception – Dancing! Shortly after dinner, my mother shared an observation with Ryan Somma. Her statement was indeed accurate as this was a great wedding for dancing! The DJ brought a lot of props (cow bells, wigs, hats, drums, etc) to compliment the music. I suspect that encouraged even MORE people to dance, making my dancing experience even better. w00t! Okay, I need to say something. I was wrong. When I first heard there was going to be a photobooth at the reception, I thought it sounded like a ridiculous waste of money. I was wrong. I was very, very wrong. The service, provided by Poshbooth, turned out to be an excellent addition to the reception. For each photo session, two printouts were made. One for the people in the picture and one for the bride and groom’s guest book. Not only was it documenting the event, but it turned out to be a source of great entertainment. Couples would get together and plot out their four shots. Watching my poor brother fail to convince his girlfriend to punch him in the face was particularly amusing. Pawpaw Hunting at Dismal Swamp State Park	The Latest in Bridal Fashion – Sumo Wrestling Suits! It was a good wedding. 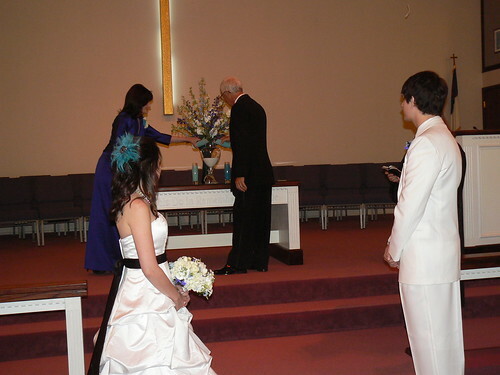 That was the second sand ceremony I’ve seen – the first was at Brent’s wedding back in May. And you got to do something that I’ll never get to do: be a groomsman. That’s close enough to bridesmaid anyway. The sand ceremony sounds like a great idea! I just might steal that for my wedding in lieu of a unity candle. Have you heard of the rose ceremony? Google it if not, it’s beautiful and not at all The-Bacheloresque.